I knew I was different when I was about nine. I always found a reason to cuddle up to women; always wanted to impress my good-looking female teachers and was forever gazing longingly at female characters on TV. But it wasn't until aged 16, when ITV's 'Bad Girls' outed me to myself with their on-screen lesbian romance, that suddenly life made sense. I hit message boards, went about watching gay shows in secret and rewound romantic scenes between two women until the poor VHS tapes met their makers. Even though I quickly got used to the idea, I still kept it to myself for a year or so. Looking back, I must have appeared quite reserved at this time. I grew in confidence as a (secret) gay woman online whilst simultaneously struggling to appear heterosexual in the real world. Cracks began to show and eventually, with the support of online friends, I decided it was time to step out of the proverbial closet. Of course, being an angsty teenage version of what I am now, I wasn't satisfied to stick just a toe out. Oh no! This was long before I'd heard of the term risk assessment. Picking my moment spectacularly (after a funeral, in the same week that I'd had my bum-length feminine hair chopped into a boy-short crop and had my nose pierced) I decided to tell my parents I was gay and (cue passive-aggressive tone) there was nothing they could do about it. I guess the knock-on effect of being 'out' online but straight in the real world was that I had developed a bitter attitude to people before they'd even been given chance to process my news. to that at the same time as they got the revelation." Maybe this was a defense-mechanism, who knows, but it certainly didn't evoke the ideal response. My parents hated it, couldn't deal with it, said some things I know they wish they could take back now; with the result being a three month stand off in which none of us were prepared to talk, let alone work out how to move forward. After a further six months of inter-family awkwardness and under-the-carpet dusting, me and the elephant in the room decided this wasn't going to get any better. As an only child, I was scared to death of losing my parents and so a sacrifice had to be made. Solution: I decided I'd to 'go back in'. Of course it would now require a substantially larger, nailed-shut closet with chains and locks, but I would certainly do my best to stay in. So, ‘straight’ again, I went to University as girly as ever. My hair grew back, my piercings came out and, whilst I didn't want to admit it at the time, I did start to feel like myself again... in image, at least. To keep up the pretence, I fabricated stories of happy relationships with boys and sent home tales of new guys that I was getting to know. I did have a few boyfriends at this time but they all made my skin crawl when ever they tried to touch me. By this stage I was believing my own lies and telling myself that this repulsion was only happening because I just hadn't met the right man yet. My parents appeared satisfied and although deep down I was unhappy, the trade off seemed to work for a while; eight years actually. When I say 'worked' I mean worked for everyone but me. Then, one day at a friend's party, completely unplanned, I called one of my best friends to one side and - heart racing and through held breath - blurted out "I'm gay". It had seemingly gotten to the point where I couldn't hack living a lie anymore, though I wasn't consciously aware of this as I got ready for the evening (my Coming Out outfit was rabbit fancy dress. Ideal). Older and wiser, I had clearly risk assessed and concluded that my happiness was worth the risk. It paid off. The response from my friend: "Really? Nice one! Brilliant! This is great news! I'm so happy for you." And breathe. Well, that was easy! So easy, I thought I'd have another go with another friend. 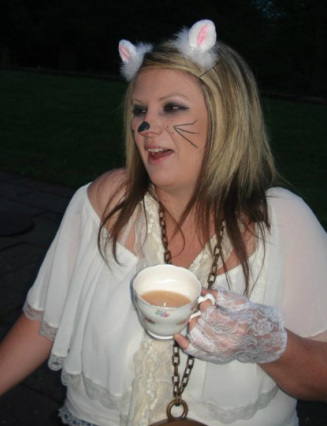 In fact, I was there all night, coming out all over the place in my bunny get-up! My delivery got substantially better as I went along. I may even have injected a bit of humour here and there, matched perfectly by the responses which where nothing short of brilliant. They ranged from disbelief, emotional outpouring, jibes about being ‘the only gay in the village’, proposals of child fathering, toasts, cheering, tight cuddles and pride. Lots of pride. "I was in my element and for the first time ever, I felt like I was in my own skin too." I was out to my friends for a couple of years before I braved telling my parents again. In all this time I'd been dating women and even moved in with a woman. My mum and dad dropped hints telling me they knew and I planned to tell them on that basis, but then they would say things that made me think they didn't know and I'd talk myself out of it again. The turning point for me came when I noticed how well my parents got on with two women in their street who lived as an openly gay couple. Then a new employee joined my dad's workforce, a very openly gay man with a successful career. My dad got on really well with him and bugger me if my parents didn't go to his Civil Partnership! That was it, it was time. They would be fine. They would surely be fine. Wouldn't they be fine? God I felt sick. Even at 27 years old I did NOT want to have 'the conversation' with them, particularly considering how well it didn't go last time! Then one day, again unplanned, I told my mum over coffee. "I told her in a matter-of-fact way just like I was telling her about a new job. And.... well, she was fine. Absolutely fine." She said it was a shock when I was 16 but they knew it wouldn’t go away. She said they'd had time to get used to it, to reconsider their own prejudices and concerns and be happy that I could be happy. She told my dad later that day and he phoned me that evening to give me his blessing and support. They were absolutely bloody fine. Who knew? This was over a year ago now. We've since discussed gay marriage, gay parenting and all that goes in between. Basically now I live my life how I deserve to be living it and I never look back. It would have been lovely to have had immediate success with Coming Out, but it happened this way for a reason. Maybe it happened this way so i could tell my story. Whatever the reason, my life is great. I don't look back with anger or regret. I'm here now - here and happy - and that's all that matters to me.